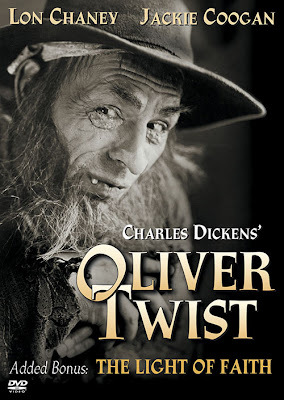 Oliver Twist is well shot and well paced; the work of a director, Frank Lloyd, confident in his art, his cast, and his source material; a model, really, for adapting great work without being enslaved by its reputation. It is unlike so many silent films based on books, which acknowledge and lionize their source (often in the film!) then deliver their take on it almost apologetically. The orphan’s hardships are all here in Oliver Twist, but condensed. Intertitles are rare, despite the temptations of Dickensian prose. It demands to be judged on it own terms. Now, it helps when your leads are two of the silent era’s most memorable talents. 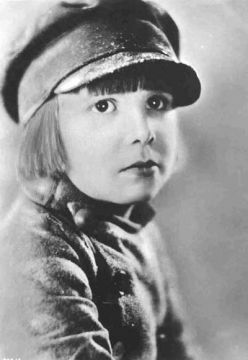 Playing Oliver we have Jackie Coogan: media sensation at age 8; destined to inspire a major piece of child-actor legislation later in life, and later still, to brighten lightbulbs as TV’s Uncle Fester. Coogan could have gotten by on being cute, but he doesn’t here. Nor is he one of those child stars so innocent of his mannered acting that he endears by default. Coogan, as Oliver Twist, controls us. He does it with his face: a perfect pale apple under tossled dark hair, a naturalistic instrument of expression. With it he gives us comic hesitation, greed and fear; rarely with so much as a gesture overstating his point. Lloyd gives the boy plenty of close-ups, but few actors could have done so much with them—and in turn, propel a film forward that might otherwise have seemed too thin. Like Garbo (lust), and Pickford (tenacity), Coogan embodied a thing: tragedy. Specifically, the kind of tragedy that befalls innocents, which we all agree is undeserved, cruel and unfair; uniting us in our sympathy even before Coogan’s forlorn eyes magnetize us and the story begins. The orphan’s grief is so pure we can taste it. It just flows from his face when he asks the gigantic, pancake-faced Mr. Bumble (James Marcus) for a little more to eat. But Coogan’s innate gravity allows the film to have great moments of farce, too—he’s often part of them: cartwheeling after a speeding carriage on the road to London, for example; being chased into the middle of a Punch and Judy show and being throttled, slapstick-style, in place of the puppets--without losing its serious thread. The film’s other still-noteworthy cast-member is Lon Chaney—he of the thousand faces. 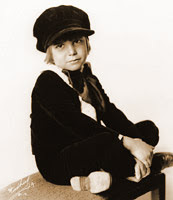 Chaney plays Fagin, the infamous master and trainer of boy-pickpockets. He’s unrecognizable in his makeup, but that’s always the case when he wears it—in visual terms, Fagin is one of his less interesting works of art: a crouching, bearded and capped Shylock figure, likely a more grotesque version of some vaudeville archetype leaned upon for years. But Chaney’s hands make this Fagin special. He’s always touching someone’s chest it seems, or fluttering his fingers in the air as he talks to someone, as though he were playing an instrument. He almost crawls up burly Bill Sikes’ frame as he colludes with the killer—you wonder how Sikes (George Siegmann) could or would stand the smaller man’s presence, but he does. You keep on wondering, and watching. Cuts to the source text maximize Fagin’s time on-screen, and the movie is better for it. This post is more about two performances than about the movie itself, I know. 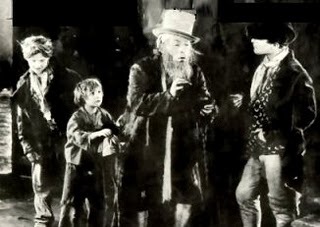 But Oliver Twist (1922), I think, is more about two great characters than its own story. And chances are you know that story already, anyway. If you went to my high school, you certainly do. You can get a lot from the book that you can't get here, but what the book can't give you are silent moments both subtle and broad, brought to you primarily by a little boy and a man in a load of makeup—each at his peak, and supremely talented. Read the book, then watch this flick. Enjoy them both. Eat them up. 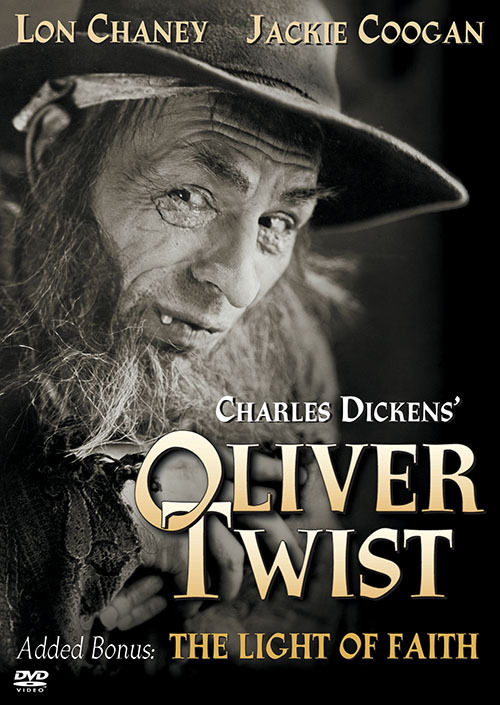 Oliver Twist is available on DVD from Image Entertainment. The disc also includes a bizarre, 30-minute Lon Chaney short called The Light of Faith, cut down from the feature-length The Light in the Dark (1922)—a film I’ll definitely write about one day if it shows up on video. That was a good essay. I haven't seen this one yet. I'm glad you mentioned Chaney's hands. His hands and his eyes are always the main things I watch in any of his movies. Thank you. I can only imagine the wonderful performance Chaney gives in this movie, based on your vivid description.